Wednesday is a regular market day for Great Yarmouth which attracts a small number of coaches to the town. 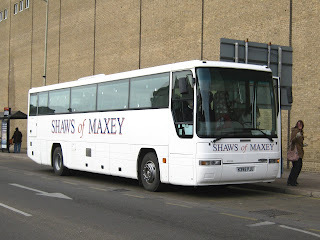 Today Beach Coach Station played host to five vehicles at 14:30; with three of them being from the Shearings' Group. 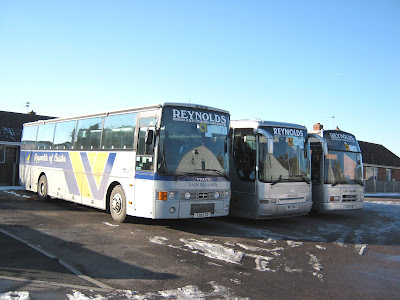 The trio of Volvo B12M's were parked together and comprised Shearings Grand Tourers 712 (MX05AHD) and 609 (MX04AEK) plus National Holidays' YJ03VOK. Today I spent a couple of hours or so in Great Yarmouth and captured a couple of sightings for the blog. 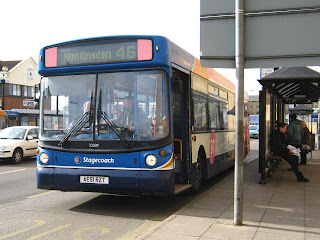 I travelled into town on a First Dart and, from Gorleston High Street, we chased one of Anglian's Tridents into Market Gates Bus Station. Having arrived in plenty of time before its next duty, it rested in Bay H prior to working the 14.30 to Southwold. I waited until it emerged from the gloom before getting my picture of 511 (X384NNO). 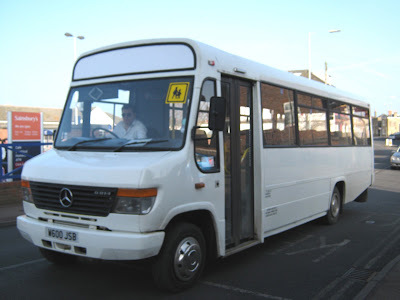 I then proceeded to Beach Coach Station and on the way I was fortunate to observe Reynolds Coaches' latest acquisition Mercedes Vario W600JSB in all over white. I photographed her heading west on St Nicholas Road. The Beach Coach Station, however, yielded nothing! Former Caroline Seagull AEC Reliance 531FN is in the news once more. The Reliance has Plaxton Panorama Elite bodywork and was one of a number acquired from East Kent by Caroline Seagull. 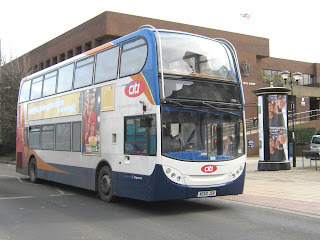 The Great Yarmouth operator ceased trading in March 2008. Most of Monday was spent in Peterborough. 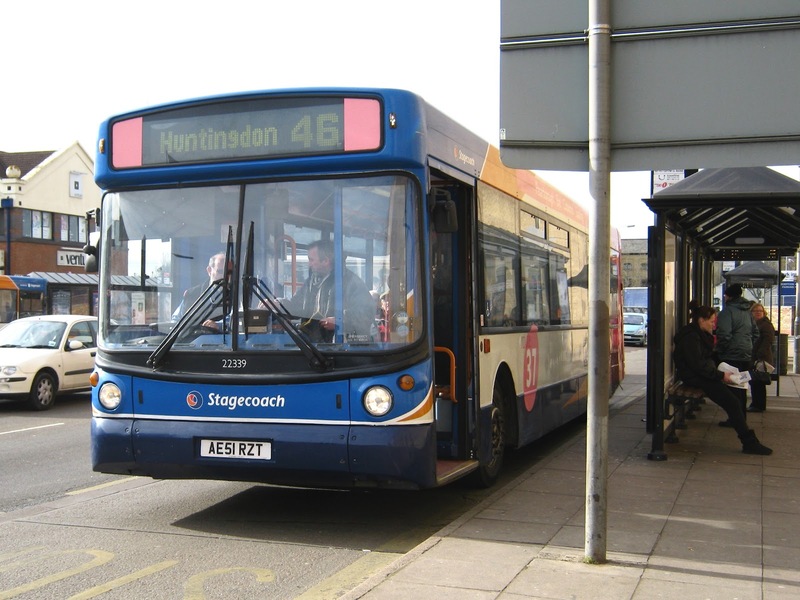 Whilst the 'better half' did some shopping I was allowed off the leash to observe some Peterborough bus operations! My first location for photographs was at the cold and very windy location of Bourges Boulevard next to the pedestrian crossing at Bridge Street. 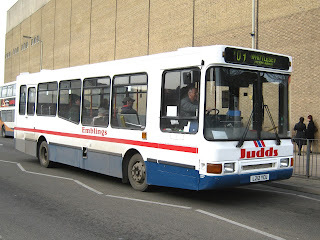 Next up was Emblings/Judds Volvo B6 L212YCU. 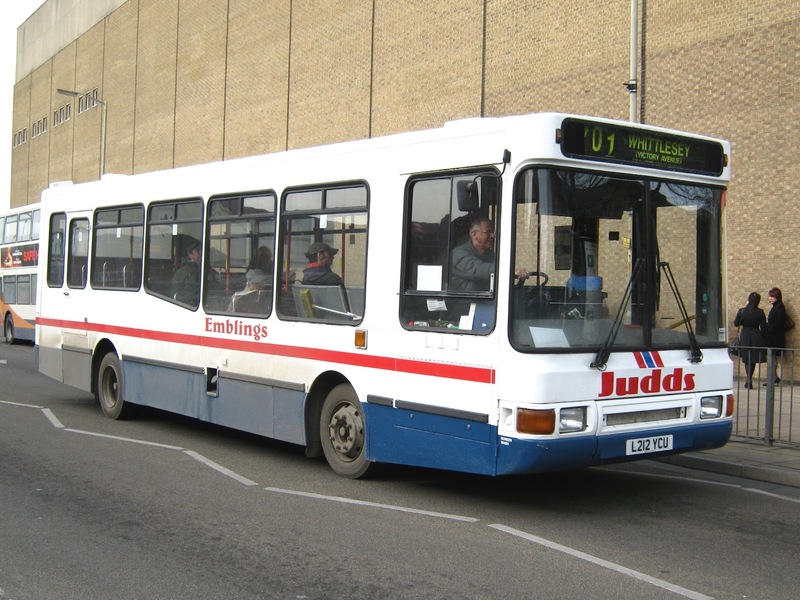 Dating from 1994, the vehicle has Northern Counties bodywork and was employed on their Whittlesey service. Shaws of Maxey were using K395RJU and P6CAP on workers' shuttle services. Dennis Javelin K395RJU (seen left) was formerly with Martins of Kettering. Whilst Volvo B10M P6CAP was new to Capital Coaches of West Drayton. Following along soon after was Stagecoach East's ADL Enviro 400 19702 (AE60JSV). Crossing the road for a new backdrop for the pictures I quickly got a shot of Wright StreetLite MX61BZZ - on loan to Enterprise Peterborough from Mistral. 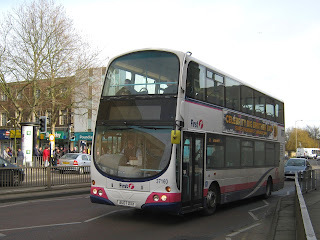 Luckily I was on the right side of the road to get a snap of First's Volvo B7TL 37160 (AU07DXX) nearing journey's end on the X1 from Lowestoft. 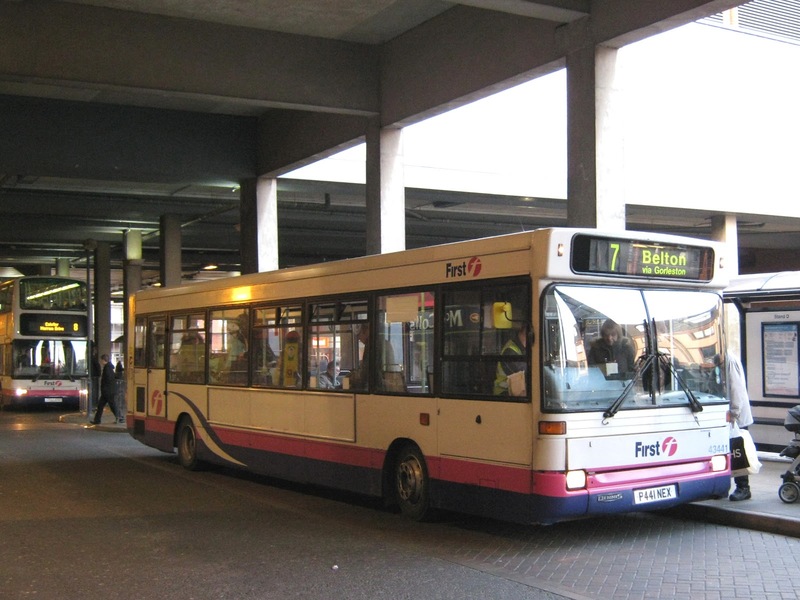 This was believed to be the 7.45 service from the Suffolk resort and was running 10 minutes down. Next, it was time for lunch and yet more shopping and it wasn't until late afternoon before I ventured to Queensgate Bus Station for some more photographic opportunities. I arrived in time to see Kimes PO51UMS unloading having arrived on a school's service. Dennis Trident PO51UMS was new to Blue Triangle in September 2001. My final picture is of a Great Yarmouth based vehicle - an Ambassador Travel Volvo B12 working National Express route 308. 181 (FD54DGV) is enjoying its Peterborough break whilst working the 12:45 Birmingham to Great Yarmouth. Unfortunately, all good things must come to an end and it wasn't long before we were heading for the rail station to catch an East Midlands service back to Norwich. I hope that these photos have given some idea of the variety of vehicles working in the Peterborough area. These and more pictures from the day can be seen on my Flickr site soon. Finally apologies for the delay in posting to the blog - this was caused by software difficulties and I hope this hasn't spoilt your enjoyment of the report. Grahame Bessey reports the arrival of W600JSB at Caister on Sea operator Reynolds Coaches. 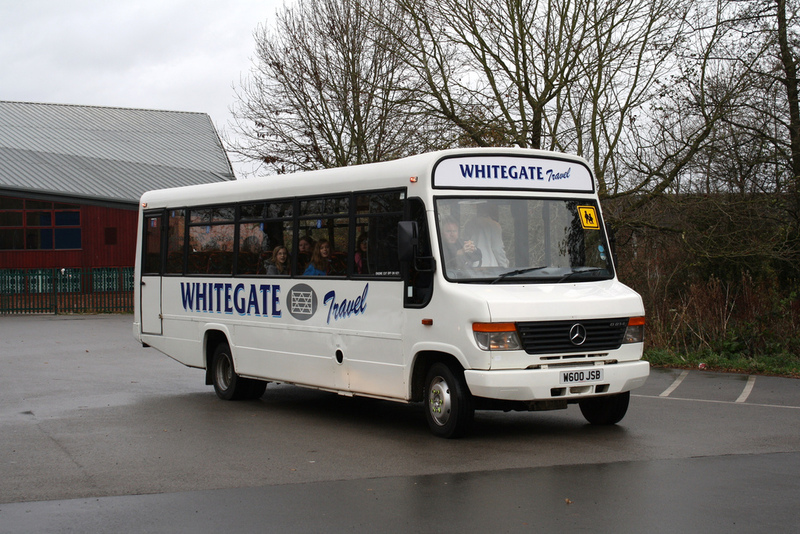 The vehicle is a Mercedes Benz Vario 0814D with Plaxton Beaver B31F bodywork and is currently in all over white livery. W600JSB has a a liitle history in that she was originally registered W60CBC when with Coakley of Motherwell in Scotland. 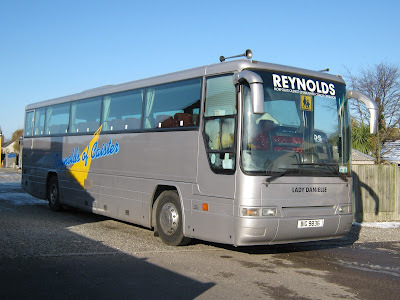 Reynolds obtained it from Whitegate Travel of Anderton in Cheshire. Before that it was with Pickford of Chippenham in Wiltshire. Photo courtesy of Nick Mannion. On the Anglia & Thames Valley Bus Forum it has been reported that a former Great Yarmouth Blue Buses Volvo B10M/Alexander RV double decker came off the B1086 St Ives Road on Friday. The vehicle concerned is believed to be either F50ACL or F51ACL. Both are currently owned by Dews of Somersham. Some observations on this afternoon's/evening's activities which may be of interest to blog readers. 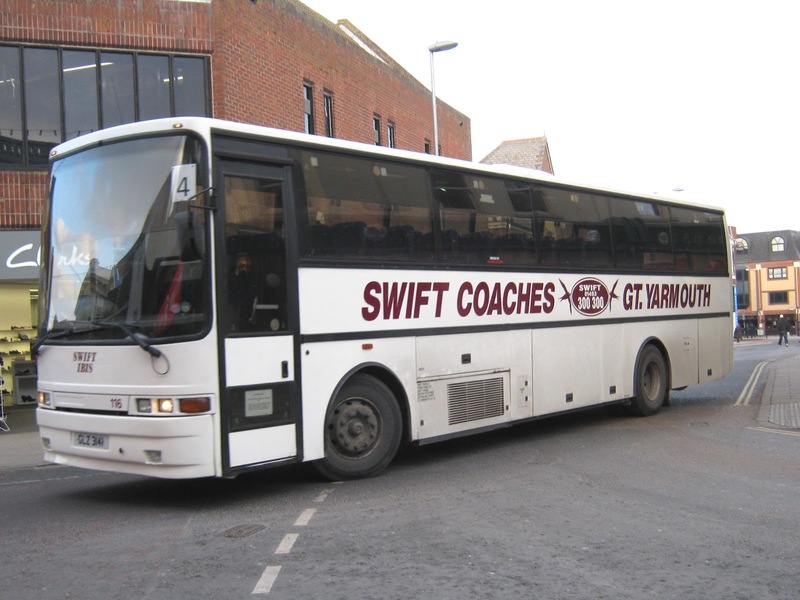 Firstly, with the start of the school contracts in last September, there are now only limited workings through Market Gates Bus Station by Swift Coaches. However, Iveco minibus 76 (YX51JPY) and Volvo B10M 116 (GLZ3141) continue to make regular appearances on services following the end of the school day and today was no exception. The Volvo (shown above) turns into King Street from Regent Street and runs back empty to Swift's Southtown Road yard following the end of its day's duties. GLZ3141 was previously registered M733KJU and has been named Swift Ibis. First Eastern Counties were using Dennis Dart 43441 (P441NEX) on the 15.50 service 7 to Belton as seen below. Finally, First Volvo Olympian 34113 (W433CWX) disgraced itself by breaking down on Crab Lane in Gorleston late this afternoon. She was seen being coupled up to a tow truck at 17.30 this evening before heading eastwards. ﻿A Dennis Trident caught fire on its return to Norwich following an MOT at Great Yarmouth's Caister Road depot on Tuesday. There were no passengers on board at the time﻿﻿. Trident to catch fire in the vicinity in the last ten months. In May last year one of the Norse Tridents was noted on fire at the Postwick roundabout. During yesterday afternoon two of Shearings coaches were noted dropping off their passengers at Great Yarmouth's Carlton Hotel. 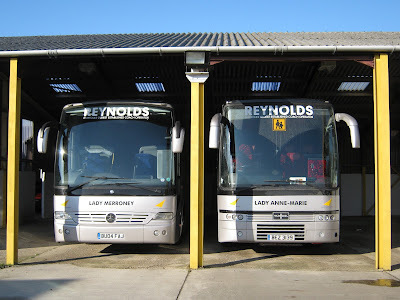 I visited Reynolds Coaches of Caister during yesterday afternoon and some twelve vehicles were seen and photographed. The visit was made in the early afternoon so that only a limited number of vehicles had departed on schools/college duties. The main purpose of the visit was to try and put some of the names to vehicles and to some extent I managed in filling a few blanks. Snow fell in the Great Yarmouth area during early Sunday morning (5th February) and a lot of the white stuff still remained today. 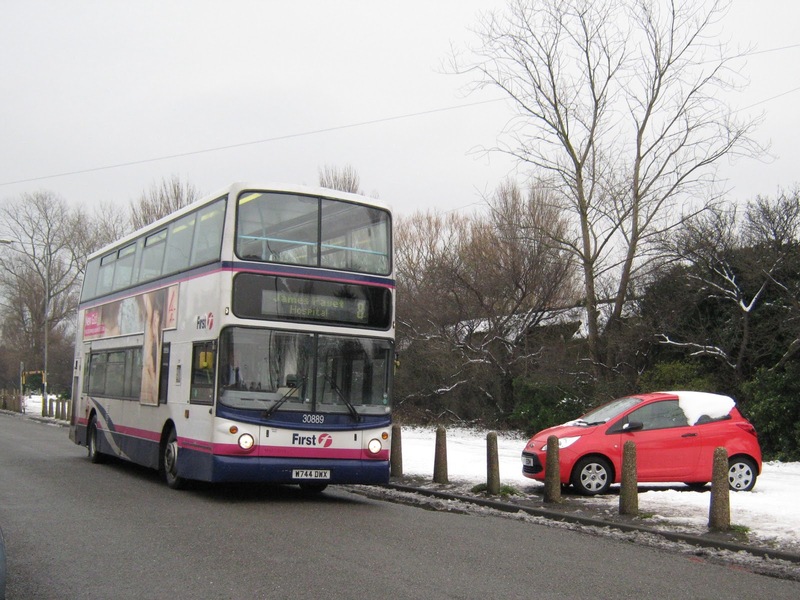 An opportunity then for some pictures of buses in the snow! 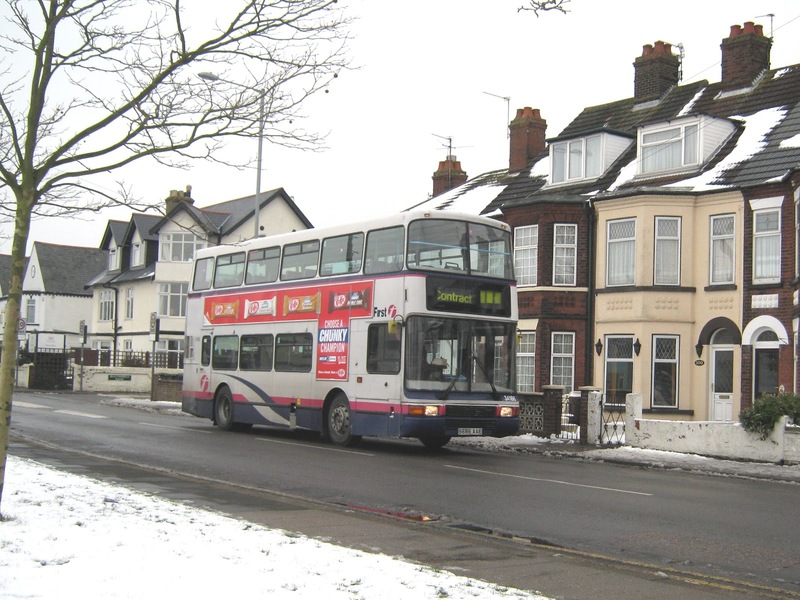 The first photo is of First's Volvo B7TL 32206 (LT52WTL) travelling eastwards on Beaconsfield Road on the service 8 to Caister. 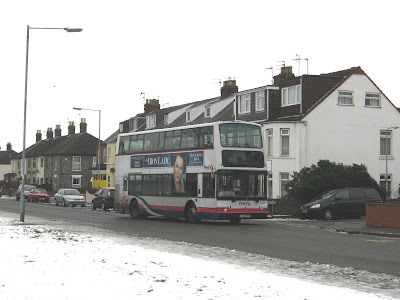 A further ten minutes lapsed before another B7TL (this time 30889) was snapped westbound on Beaconsfield Road bound for the James Paget Hospital via Market Gates . Finally, I made my way over to Caister Road Depot where Dart 43444 (P844OAH) was found dumped in the rear yard. Her future looks uncertain after she sustained damage at the front following an accident in early January. First Group, the main provider and organiser of bus/coach travel for the London 2012 Olympic Games, has launched its new online booking website. 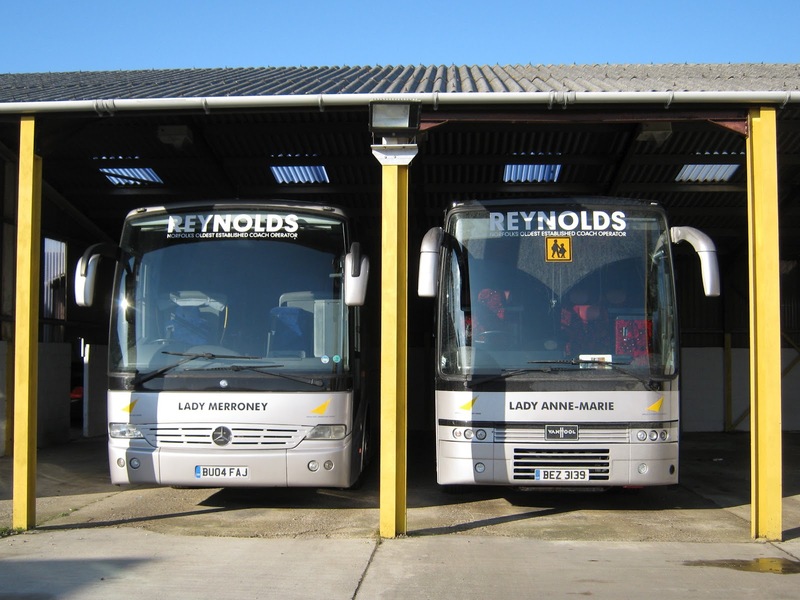 In addition to providing Park & Ride services to and from the main Olympic venues including Olympic Park, ExCeL, Weymouth and Portland, Lee Valley White Water Centre, Hadleigh Farm, Eton Dorney and Greenwich Park, they will also be running special coach services from towns and cities across the country. In the Norfolk and Suffolk area, these special services will be running from Diss, Great Yarmouth, Ipswich, Norwich and Thetford. The Great Yarmouth service appears to operate three times daily to the Olympic venue at Stratford, East London. A brief visit to a very cold and miserable Beach Coach Station this afternoon revealed two vehicles on site. Lowestoft-based Belle Coaches Mercedes Tourismo 17 (BC10BEL) (above) was keeping company with National Holidays Volvo B10M 49 (YC02CFX). 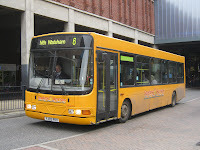 The March 2012 issue of Bus & Coach Preservation contains articles of interest to the Great Yarmouth bus enthusiast. Firstly, there's a feature on the recent extensive restoration of a 1964 former Great Yarmouth Corporation Pennine-bodied AEC Reliance. David Jukes reports on the work undertaken at the East Anglia Transport Museum at Carlton Colville. The centre spread is of AEX85B passing St Peter's Church in the village complete with Gorleston Beach displayed on the destination blind. 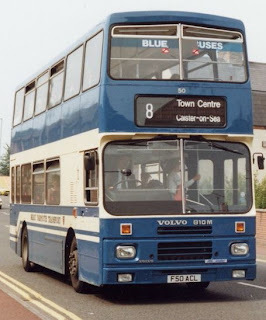 On subsequent pages there is a selection of pictures celebrating the final years of the 'blue buses' on the streets of Great Yarmouth. Pure nostalgia! Finally, also included is a report on the Southend Running Day on the 1st of January 2012 plus an Essex Special comprising a selection of Leylands operating in 'deepest, darkest Essex'. The new fares, announced on its website, are due to rising fuel costs and a twenty per cent reduction in bus service operator grant received by the company. The statement indicated that it was the first increase since November 2010 and that the combined costs to Sanders was 'in excess of £400,000'. Sanders believes it still offers extremely good value for money and that the severe increase in costs leaves them with no alternative if the company is to remain in business. Sanders provides bus services mainly to the north and east of Norwich serving towns such as Acle, Aylsham, Cromer, Fakenham, Great Yarmouth, Holt, North Walsham, Stalham and Wroxham.